1. Carry the Smart Key. 2. Either press the door handle button or press the Door Unlock button (2) on the smart key. 3. The driver’s door will unlock. The hazard warning lights will blink two times. The door handle button will only operate when the smart key is within 28~40 in. (0.7~1 m) from the outside door handle. 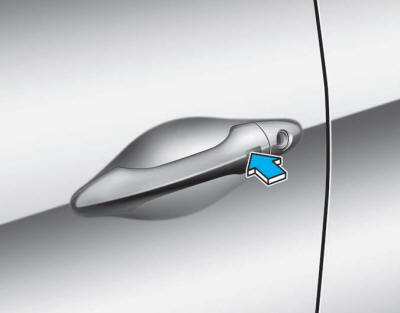 Other people can also open the doors without the smart key in possession. If you press the Door Unlock button again within four seconds, then all the doors will unlock. After unlocking the doors, the doors will lock automatically after 30 seconds unless a door is opened.